Chelsea vs. Manchester City : 14 April 2013. There was no doubt that an F.A. Cup semi-final against Manchester City would always be a very stern test. When we were still mired in our battle in the quarter-finals against Manchester United, the news that we had drawn their city rivals in the semis was met by a big silent groan from me. I am sure I was not alone. Manchester United were eventually despatched and City loomed on the horizon. Our timetable has been ridiculously busy, but a day out at Wembley was always in my focus. It would undoubtedly be a huge game, a huge day out. I couldn’t wait. After a wet day on the Saturday for the Wigan Athletic vs. Millwall semi-final, the weather on Sunday morning was a lot more agreeable and almost Spring-like. Parky was collected en route and the banter commenced. Apart from his visits to Stamford Bridge with me this season, his only other games were the August matches at Brighton and for the Community Shield game against City at Villa Park. This hasn’t been the best of times for him; however, the game at Fulham on Wednesday should be his first “proper” away match this season. I’ve missed his company on those away trips up north this year. As we rattled along the A303 and the M3, our anticipation for the day ahead increased. Parky was in good form. We were both bolstered by a large McCoffee apiece and the caffeine did its trick. Tons of laughs. Tons of banter. Tons of jokes. I was well aware that there would be a number of ways in which I could describe our recent magnificent run of results in cup competitions. There were numbers flying around my head all weekend; I was performing various routines of numerical gymnastics on Saturday and as I drove to London on Sunday morning. Our game at 4pm against the current league champions would be our 11th. F.A. Cup semi-final since 1994. 11 F.A. cup semi-finals in 20 seasons. 12 visits in less than 6 years. Looking further afield, the numbers became even more extraordinary. That’s easily more than one per season. This season, for all of its faults, we have hit four semis. Not all have been in the Abramovich era I am quick to add. 10 came in the 1993-2003 era; 18 since. Who says that our success are recent, our history negligible, our success due to Roman alone? Yet, here is the contrast. From season 1973-1974 to season 1992-1993, we appeared in just 2 major semi-finals. Looking back, with my first Chelsea game having taken place in 1973-1974, I’m wondering if I was some kind of jinx. Not to worry, those twenty years of famine were not my fault. And we’ve certainly made up for it since. What was the catalyst for change in 1993-1994, then? Parky and I discussed this on the drive to London. The answer was Glenn Hoddle, who arrived in the summer of 1993 as one of the hottest properties in English football, having steered Swindon Town to promotion to the top division, playing some gloriously entertaining football along the way. 1993 was not a good year for me, but my spirits were raised several notches when Ken Bates managed to capture Glenn Hoddle’s services. Hoddle transformed the way we played on the pitch – a passing game rather than a more rudimentary style of football – and also off it, by modernising our training methods and dietary regime. The new Chelsea awoke from its slumbers in 1994. We have, without much doubt, never looked back since. And there’s my “stop moaning about Chelsea’s recent poor performances, you buggers, you lot wouldn’t have lasted two minutes in the grim old days” section of the match report completed. From Lillie Bridge to Wembley, we’ll keep the blue flag flying high. Incidentally, “The Blue Flag” was born in that 1993-1994 F.A. Cup run and has been a constant companion on our jaunts to Wembley ever since. After a change of train at Notting Hill Gate, we were soon at Marble Arch. Then a quick walk up the Edgware Road to Harrowby Street. Some mates were already basking in the early-afternoon sun outside the Duke of York. We stayed from 12.15pm to 3.15pm. Three hours of kicking back and enjoying each others’ company. The days of us dressing up in Chelsea shirts of various vintages to watch us at Wembley are now long gone; I think I’ve only ever worn Chelsea shirts – both of the vintage variety – on two occasions. Instead, the lads were dressed normally; or as normally as we can under the circumstances. Parky : an blue Aquascutum polo-shirt and a swish new pair of Forest Hills. Daryl : a trusty lemon Lacoste and Ben Sherman desert boots. Millsy : an Armani sweat top. Alan : an Yves Saint Laurent shirt. Rob : a Paul and Shark shirt. Chris : a black Henri Lloyd polo and a pair of Nikes. What did we talk about? Anything and everything. Not many of my Chelsea acquaintances are venturing to the away game in Basel. We learned that hotels in the Swiss city are virtually non-existent due to a massive watch and jewellery convention which is taking place at the same time. Most Chelsea fans are staying in other cities. Of my close mates, only Rob is thinking about going. As for the rest of us, all eyes are on Amsterdam. There are already a few contingency plans afoot for the potential Europa League final on Wednesday 15 May. After 40,000 Chelsea fans invaded Munich last May, surely similar numbers will travel to Holland’s sin city in 2013. We laughed as we remembered Spurs’ exit from the completion on Thursday; Adebayor’s miss especially. As the pints of Staropramen went down well, talk inevitably turned to discuss the idiotic behaviour of a few Millwall fans at the other semi-final. The general consensus was that it was simply pockets of various factions of their combustible support rowing amongst themselves. Rob, who always seems to be the most knowledgeable on these things, reckoned that it was, for example, Millwall Peckham having a go at Millwall Bermondsey. I won’t give these idiots the oxygen of publicity but I will comment on a Millwall fan who ‘phoned “606” on Saturday. He believed that “there was Chelsea and West Ham in the Millwall end. It was easy to get tickets. And then Millwall gets the blame.” What a load of nonsense. Why would a handful of Chelsea fans enter a stadium holding some 30,000 Millwall fans, probably a good 10,000 of whom were “up for a bundle?” If Chelsea – or West Ham – fancied “getting it on” with Millwall, it would be well away from Wembley, not under the scrutiny of CCTV. All of us were just relieved that “The Wall” were out. I still have memories of a momentous battle at Stamford Bridge between Chelsea and Millwall in 1977 and I was not ready for a re-match. I’ll be quite happy if we never play again; they truly are a blight on football. The sun was beaming down and there was a succession of ‘eighties pop on the pub juke box. Sunderland were winning at Newcastle. Parky was winning at drinking. On the walk to Marylebone station, I chatted to Simon about the first of our run of F.A. Cup semi-finals; a game against Kerry Dixon and Luton Town at Wembley in April 1994. I always maintain that the match, which we won 2-0 with two goals from Gavin, was a very pivotal game in our history. If we had lost, we would have had nothing to show for our efforts. However, because Manchester United, who we would meet in the subsequent final, were soon to win the league – and with it a berth in the following season’s Champions League – our participation in the Cup Final automatically guaranteed us a place in the old ECWC. The win versus Luton therefore allowed us European football for the first time since 1971, where we reached the semi-final stage the following spring before losing to Gus Poyet’s Real Zaragoza. Our profile was raised within Europe and in the summer Ruud Gullit signed, to be closely followed by Mark Hughes. The times they were a changin’. Simon agreed with my appraisal, but added that the 2-1 win over Liverpool in 2003 was much more important. I soon realised that he was correct. Although we did not know it at the time, out finances were in a perilous state after years of over-spending. The win gave us Champions League football and how we celebrated. Waiting in the wings was Roman Abramovich and the rest…as they say…is…er, history. In amongst the talk of these pivotal games in our history, the game at Bolton Wanderers in 1983, of course, should never be forgotten. We caught the 3.26pm train from Platform One at Marylebone; it was all Chelsea. There were lovely memories of last season’s double trips on the same route for the Spurs and Liverpool F.A. Cup games. The singing was minimal, though; maybe we are getting used to all this. Of course, this is true. However, I was very relieved that all of our allocation had been sold for this game. We had, in fact, been given extra tickets. This measured up favourably to last year’s Spurs semi-final when several hundred seats went unused. Within ten minutes, we had arrived at Wembley Stadium train station. Up the hill, with the huge bulk of the stadium ahead, the wind increased. In the shadows of the stands, I was grateful I had packed a light jacket. I was inside with fifteen minutes to spare. I had a seat along the side of the pitch in the lower tier for the first time. All my mates were dotted around the stadium; I think most were in the lofty top tier. From row twelve, the colossal size of Wembley was all too apparent. It is quite massive. Looking around, I only spotted two or three faces that I knew. I hoped that my section would sing. If not, it would turn out to be a long afternoon, with my frustration undoubtedly rising with each failed attempt to generate some noise. Being so close to the pitch, my camera was primed for some action shots, but I first took a few photographs of the stadium. Around the top balcony, all of the previous winners are listed alphabetically – from Arsenal and Aston Villa, to Chelsea and Clapham Rovers, to West Bromwich Albion and West Ham United. Just behind me, there was an old school Union Jack, with dirty cream lettering spelling out “Chelsea FC” which was draped over the top balcony right next to Leeds United. Adversaries after all this years, memories of 1970, Osgood, Bonetti, Bremner and Gray. The teams soon appeared on the far side. We, however, were in that awful black away kit and I wasn’t happy. With John Terry and Frank Lampard dropped as per the rumours, the team was what we could have predicted. Fernando Torres, possibly deserving a start, was the one question mark. The City hordes to my left, stacked high in tiers, were the more colourful of the two sets of fans. They clearly still think it necessary to dress in team colours for big games; we think that is so 1990’s. They also slightly edged the number of banners. None of our large ones had made it from the royal blue balconies of Stamford Bridge. This was not good. This was not good at all. Milner, Aguero and Tevez were causing us problems with their quick movement, while Yaya Toure was his formidable self in midfield. A mixture of resolute and lucky defending managed to keep City at bay. Petr Cech was in top form; he needed to be. The shots were raining in on his goal. Our only real attempt in the first thirty minutes was a bouncing shot from Eden Hazard which was easily cleared off the line by the cool Kompany. Just when Chelsea’s play began to improve with better possession and movement, City struck. That man Toure broke from halfway, with no Chelsea midfielder within ten yards. He pushed the ball into the penalty box – level with myself – and the ball deflected into the path of Samir Nasri who quickly thumped the ball past Cech. The whole west end then turned its collective back on the play as the City faithful did a massive “Poznan.” The fans in the lower tiers were, in fact, able to keep watching the game on the large screens above them. Surprisingly, Chelsea responded and a lovely curling effort from the previously quiet Juan Mata fizzed past the far post. However, this was a brief moment of hope in a poor first half. Further chances came to City and only a mixture of awful defending and greatness from Cech kept us in the game. Chelsea fans were still making their way back to their seats as the second period began. Many will have missed the crushing blow of City’s second goal; a cross from Gareth Barry found Sergio Aguero, whose loping header found its way into Cech’s goal. It was eerily reminiscent of Chicarito’s goal at Old Trafford. I tried to be positive – “well, we were 2-0 down against United” – but even I wasn’t optimistic. We enjoyed slightly more possession, but with little end product. With the clamour around me – and elsewhere I am sure – for Torres to enter the fray, Benitez surprised us all. He took off Mikel, changed things and put Torres up front, dropping Oscar alongside Ramires. There was genuine pleasure that we would now be playing with two upfront. There was, surely, nothing to lose. The impact was immediate and stunning. Torres ran through to join Ba up front as David Luiz pumped a ball up the middle. The ball evaded the leaping Torres and Kompany, but fell behind Ba. In one gorgeous moment, he swivelled and dragged the ball from behind him, volleying it to the City goal. The nets at Wembley are especially deep but how we roared when the net eventually rippled. To be honest, Torres and Ba never really played as a pair for the rest of the game; Torres, instead drifted wide in the way that Anelka used to do. However, it was now all Chelsea. Both sets of fans roared their teams on; first Chelsea as we sensed the tide had turned, then City as they realised their team was on the ropes. Proper support. Lovely to see – and hear. It was turning into a simply enthralling game of football. We urged the boys on further. Mata’s shot hit Pantilimon, and then Hazard danced into the box and reached the bye-line before pulling the ball back for Ba. Just six yards out, he shot straight at the City ‘keeper. A free-kick from David Luiz dipped wide. The minutes ticked by. Torres was through on goal…his big moment…but soon got sandwiched. From my viewpoint, I struggled to see any foul. That he stayed on his feet probably did him no favours. A foul on the far side on Luiz – again I was unsighted – elicited a few texts implying that Aguero stamped on our Brazilian, who was having a fine game. The minutes faded away…four minutes of extra-time, but no more chances. It was not to be our day. At the final whistle, I wanted to leave the stadium as quickly as I could. 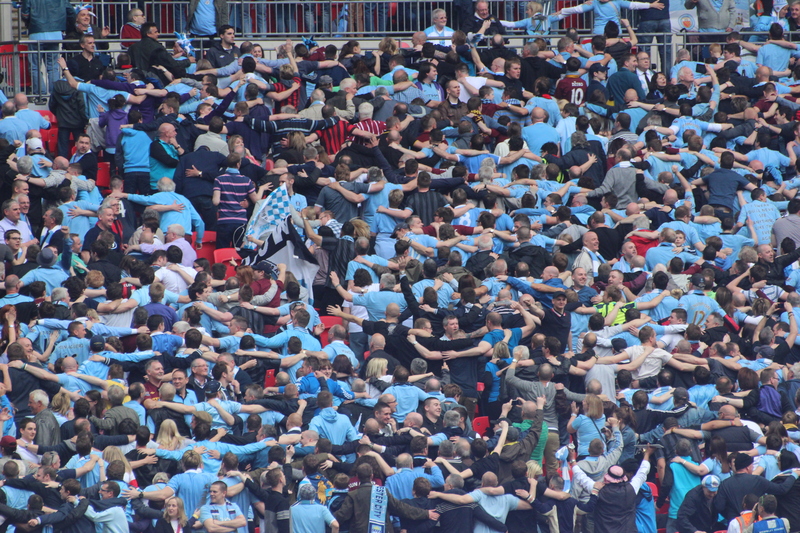 The PA boomed out “Blue Moon” and I looked over to the west end, now a riot of sky blue shirts and scarves held aloft. As I clambered over the red seats, I chuckled to myself “bloody Mickey Mouse Cup, anyway” but of course I was lying. I waited outside for Parky to arrive. Every single one of the City fans who I heard speak did so in heavy Mancunian accents. They were clearly happy. Overjoyed, even. This was only their second semi-final of any description since 1981. Good luck to them. Unfortunately, Parky had been pushed around to the north of the stadium and was at the back of the queue. We therefore made our own journeys back to West Brompton. As I filed out of the Wembley concourse, down to the line for the trains, I was surrounded by City. However, it could have been worse, much worse. It could have been Liverpool, United, Spurs, Arsenal or West Ham. Or Millwall. As we slowly edged forwards, pockets of Chelsea fans kept our collective spirits up by singing a selection of old favourites. Songs about Tommy Baldwin, Bertie Mee, Bill Shankly and Colin Pates – ah, memories of the idiotic Full Members Cup win over City in 1986 – brought many a smile from those taking part. I think this was a reflection of the riches that we have witnessed in recent seasons. I was pragmatic about the defeat and I think other Chelsea shared the same view. The better team had won, losing was not a disgrace, and we’re still the Champions of Europe. In contrast, the City fans looked bemused. Although they had been in good song during the game and only a few minutes earlier at the top of the hill, their songs had now dried up. I had to laugh. We, however, were in good voice. Defiant. Happy and glorious. Proper Chelsea.